The annual Bass Pro Shops Outdoor Days that will be held on September 9, 2017 at the Table Rock State Park is a great way to enjoy outdoor fun in Branson. This annual event gives outdoor enthusiasts the chance to learn outdoor skills and the conservation advocacy of the area’s wildlife and natural resources. Whether you are just starting to enjoy outdoor fun in Branson or an expert outdoorsman, you are sure to enjoy a wide variety of outdoor exploration opportunities and exciting activities for all ages, skill levels and backgrounds. Bass Pro Shops is proud to announce the return of the 10th Annual Outdoor Days and committed to celebrate the great outdoors and host activities designed for all levels of outdoor enthusiasts. Celebrated across Missouri throughout the late spring and summer months, Outdoor Days offer great outdoor fun activities that are designed to introduce nature to new audiences including family-friendly opportunities to learn about outdoor skills and experience great outdoor adventures. Participants in this event get to experience a variety of outdoor fun activities including kayaking, canoeing, boating, fishing, archery, rock climbing, horseback riding, camping, live animal encounters and much more. The dates and locations for 2017 Bass Pro Shops Outdoor Days are on August 12 from 10 am to 4 pm at Waterfall Park in Kansas City, Missouri; August 26 from 10 am to 4 pm at Frontier Park in St. Charles, Missouri; and September 9-10 at Table Rock State Park in Branson, Missouri (camping opportunities available). This annual event in Branson is coordinated in partnership with the U.S. Army Corps of Engineers, Missouri Department of Conservation, Missouri Department of Natural Resources, Missouri State Parks and a host of local conservation and water quality organizations. 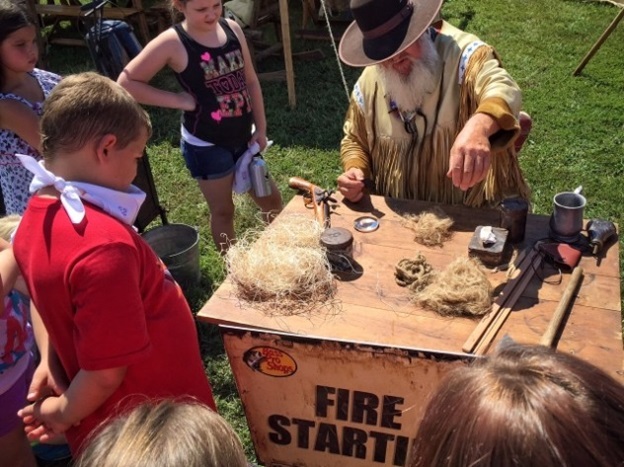 The Table Rock State Park venue in Branson will host an interactive pre-1840's mountain man rendezvous encampment in a Native American culture village. This interactive area will showcase more than 40 authentic campsites featuring more than 30 primitive skills demonstrations that include blacksmithing, woodcarving, beading, quilting, candle making, flint knapping, Dutch-oven cooking and baking, flute making and playing, dancing, singing, storytelling, drumming and more. Activities at this location will also include paddle boarding, pontoon boat rides, viewing aquariums, casting ponds, kayak pools, metal detecting, archery, air soft rifle and sling shot ranges and more. The annual Bass Pro Shops Outdoor Days at Table Rock State Park in Branson is a great way to learn outdoor skills and the conservation of the area’s wildlife and natural resources.